When homeowners think about home security, most fail to grasp the importance of their garage security relevant to the overall safety of their home. Most garages are packed with valuable items like power tools and naturally, cars. As some garages are connected to the house too, your garage may be an easy way in for a burglar. 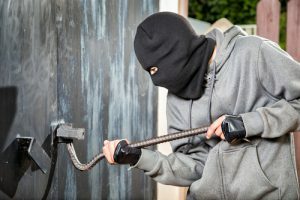 The safest way to defend against intruders is to install and connect your garage’s security system with the home security system. If anyone tries to break in, the alarm will sound off and can trigger a call for emergency services. Another great way to secure your garage is to install motion detector lights with or instead of the garage security system. Motion detector lights are equipped with a sensor triggered when they detect moving objects or a heat signature. Both animals and people can be picked up by this sensor, which (when triggered) turns the lights on for a set time. Unless further motion is detected, the lights will turn off after the set period. Old garage doors present the highest risk to National City homeowners, as they are most prone to forced entry. Because old doors are worn out from regular use, they can develop rust and become loose. Both might make it easier for a burglar to enter the garage and even your home. Unfortunately, no matter how much you take care of your garage door, this is an inevitable scenario. While proper maintenance will ensure they last longer, you will have to consider replacing them with a new model sooner or later. Install blinds or curtains so that the burglars won’t be able to see into your garage. If for some reason you can’t install these, add an extra opaque layer to your window glass. This will allow the sunlight to get into the garage, but keep away any prying eyes. One of the most common mistakes National City homeowners make is leaving their garage door remote in the car. Always keep the remote nearby, whether you are parked at a mall or at work. Don’t even leave it in your car when it’s parked in the garage. Get a small keychain remote instead of the big one and keep it close by with your house keys. You can find these replacements at specialized garage door vendors, most home improvement stores or through the company that sold you the garage door, just follow the instructions provided and you will have a compact replacement in no time. Another common mistake is forgetting to lock the door in a hurry when you rush out to work or to take the kids to school. It can happen to anyone, but don’t let burglars take advantage of that! Instead of relying on your memory, use a timer which can automatically close and lock the door in the set amount of time. Naturally, you can set up how long it takes before the door closes and locks. These timer systems can easily be installed on the garage door track. If you are unsure whether you can install it properly by yourself, contact a professional agency to perform the installation for you.